So with the New Year, I’m suddenly seeing green smoothies all over the place on the internets. Anyone else?! 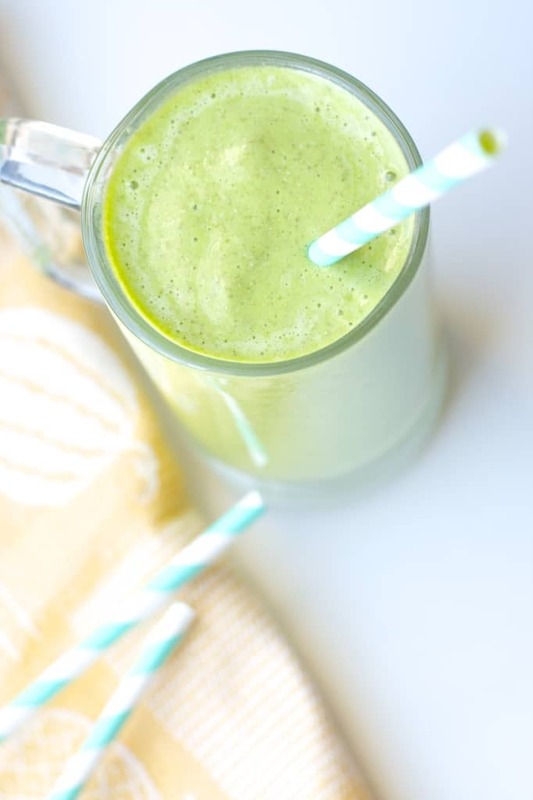 So I decided that I needed to join the party and share my favourite green smoothie with you! I like this tropical green smoothie the best out of all the combinations I’ve tried. And I’ve tried a lot. And not only because I like them for lunch fairly often. But also because I have a 3 year old that refuses to eat virtually any fruits or vegetables. (Why???? They’re so good. Why won’t he just try them?!) But. He WILL down smoothies like there’s no tomorrow. Every time. I have never put a smoothie concoction in front of him that he wouldn’t drink. And I’ll be the first to admit that some of them have been just plain gross. But he drinks them. So, I make a lot of smoothies. Because I don’t want my kid to get scurvy. This one is one of our favourites. This is one of the smoothies that I will prep ahead of time, and make freezer “smoothie packs” that can be whipped up in minutes by just adding the milk and the full pack to the blender. No need to pull eighteen bags of frozen fruit out to get a little out of each one. For some reason that is sometimes a deterrent to making a smoothie around here. (How lazy am I?!) But I find that it actually does save time to make up a whole bunch of ziplocks with everything in it for two smoothies, and then I only need to toss the contents in the blender and add the liquid. Such a time saver. I like using frozen fruit for my smoothies, as it gives the creamiest texture, and you don’t need to add ice then. I actually usually need to add some water in order to blend it, which I prefer. I also like to use plain Greek yogurt in my smoothies, to get some protein in them. I freeze my Greek yogurt in an ice cube tray, and then add a couple cubes to each of the bags when I make up my “smoothie packs” for the freezer. I toss the spinach in there too, it blends just as well from frozen as fresh. If you’re not using everything frozen like I do, you may need to add ice instead of water to thicken up the smoothie a bit. 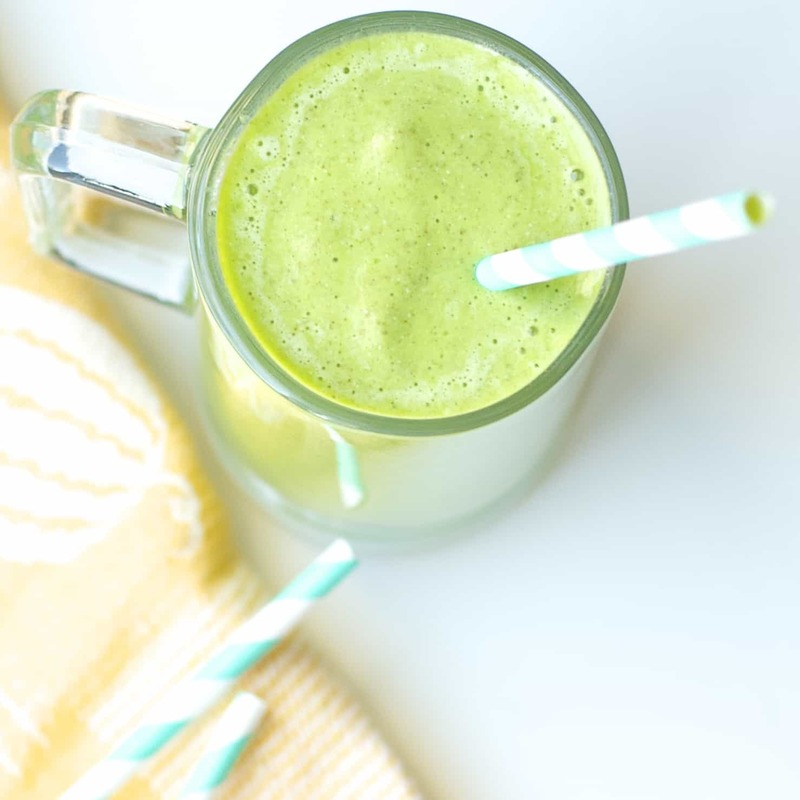 Hope you enjoy this healthy, vitamin packed smoothie as much as we do! And if you also have a fruit and veggie hating child, maybe green smoothies will be the trick for you too! Or am I the only one with one of those?! Probably not. I’d love to hear anyone else’s tricks for getting the green stuff into their kids – I’m always looking for new things to try! Note: If all of your ingredients are frozen (besides the milk!) then you will likely need to add about 1/2 cup of water to be able to completely blend the smoothie. But if your fruit and veggies are thawed, you will need to add some ice to thicken it up. Start with just the milk and add ice or water as needed. I would definitely recommend that at least some of the fruit is frozen as this will give the creamiest texture to your smoothie. Combine all the ingredients in a blender and blend until smooth. Pour into two large glasses and enjoy! I love smoothies especially green smoothies! I love the addition of mango and pineapple! Yum! I also have a 3-year old (girl) and she is sooo picky! She thinks everything new is "icky." I might try the smoothie route. That is a great idea! I also love the idea of having make-ahead smoothie packs. Pinned! Thanks Kimberly! Seriously try the smoothie route if she's picky, I am completely shocked at some of the smoothies that he'll drink when I think they're awful! Thanks for the pin! I am a big fan of green smoothies. I have been having one a day for the past couple of years and I have so much more energy because of it! They are such a great way to get a big does of fruits and veggies in aren't they? Thanks Dannii! I love green smoothies! And I also love seeing other people's favorite combos - this looks delicious! And the color - I always love the bright green color! I love seeing all the different combos people come up with too! Thanks Ashley! My brother refuses to eat any vegetables too, you gave me an idea :D Anyway this looks delicious! Love the banana, mango and pineapple combo - always a winner in my heart! I know! I love seeing all the different combos that people are making! Thanks Katrina! 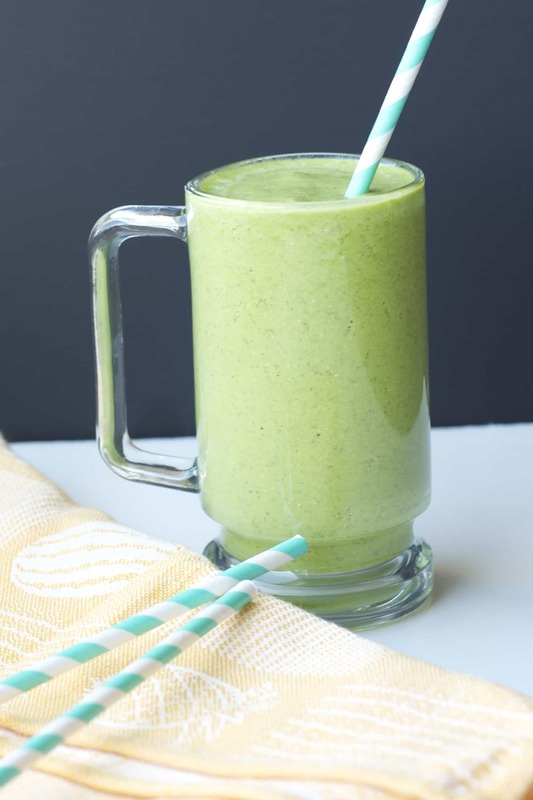 I am loving all the green smoothie recipes everywhere! I need to try one asap! this looks great Stacey! They're the best! I love that you can pack a smoothie full of spinach and yet it tastes like fruit! Thanks Manali! Okay! That is beautiful! And I love your ingredients!! And look at that..we both used the same cute stripey straws! Your recipe will be a beautiful addition to my smoothie board! hahaha, thanks Annie! Your straws matched a whole lot better though! Oh well. Didn't really think about the colour smoothie when I bought them, I just though, teal is pretty. :) Thanks for the pin! I have been seeing green smoothies everywhere, Stacey! I actually just tried my first green smoothie over the holidays, and I have to say that I'm hooked! I'm also sharing a smoothie recipe next week, though I'm loving these fruity flavors! And the chia seeds are such a great idea, too. Sounds delish! Thanks Gayle! My mom started me on the chia seeds in smoothies, although I only think to add them occasionally. They do add a good protein boost though when I do throw them in! Can't wait to see your version!